All lots have been sold. Many of the same models are currently available in our adjacent Crosswinds community. 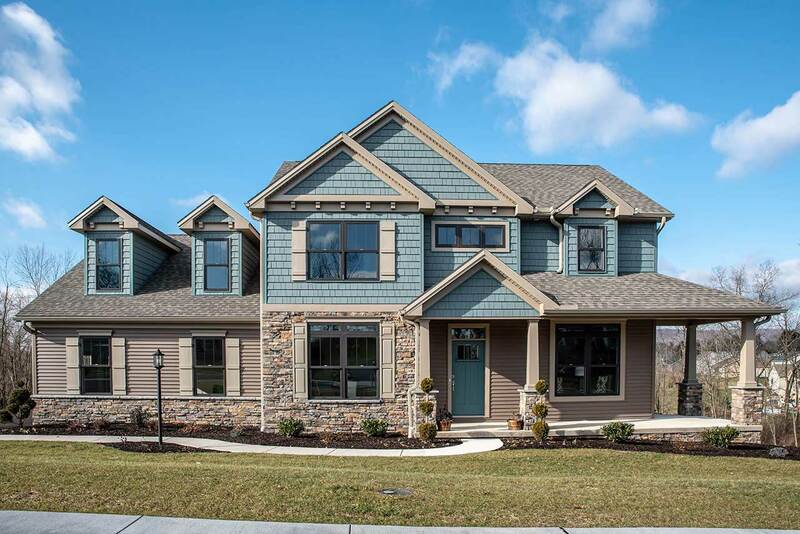 Yingst Homes, Inc. is pleased to announce Thornhill, our newest duplex community, located in popular Hampden Township and the outstanding Cumberland Valley School District. Thornhill is a community of Yingst-built duplex townhomes nested in Hampden Township. It's located minutes from the Valley Road Weis and Giant stores, the West Shore Hospital and Fredricksen center — and close to Wegmans, the Carlisle Pike, and most major highways. We offer nine different options — five ranch-style homes and four 2-story homes. All homes have open floor plans and first floor masters. Most interiors include fireplaces, skylights, areas with hardwood floors, 9-foot or vaulted ceilings, Seifert kitchens, and full basements ready for you to finish. Exteriors boast stone and vinyl facades, 2-car garages, and Anderson 100 Series windows. Living square footage starts at 1,439 square feet for a two bedroom, two full bath ranch home and extends to 2,180 square feet for a 2-story, two or three bedroom home with a master bedroom and en suite on the first floor. Prices start at $254,900. HOA fees are $105/month — which includes lawn maintenance. Only minutes from I-81 and Rt 581 and with easy access to I-83 and Rts 11/15. Residents can enjoy the nearby Hampden Township Park and the township-owned Armitage Golf Course. Other area attractions include Harrisburg's City Island, Hershey Park, the Civil War Museum, the State Capital, Hollywood Casino and Penn National Race Track, and many more. Public and private golf courses are nearby. The local 36-acre Creekview recreational park offers tennis, basketball, swings, pavilions, a fitness course, and more. Health clubs, bowling and skating are available on the Carlisle Pike. The Camp Hill Shopping Center, Capital City Mall and Gateway Plaza are only minutes away. The Carlisle Pike offers a variety of upscale specialty shops.